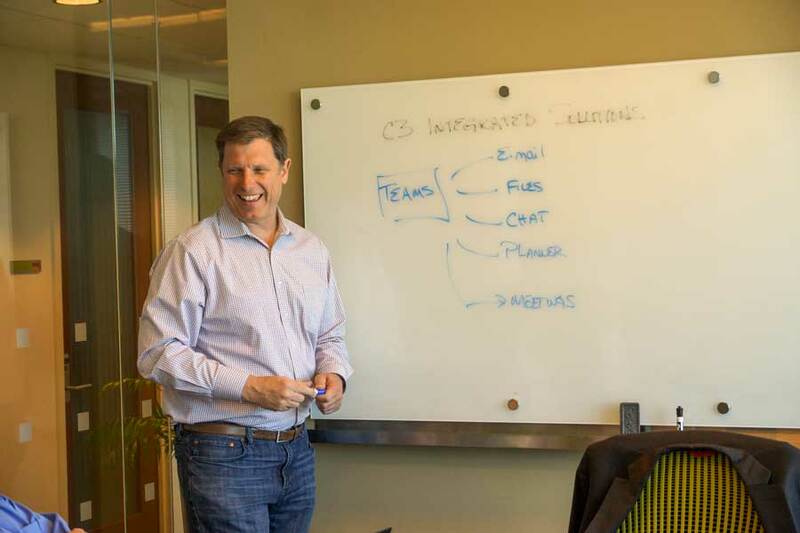 Founded in 2008, C3 Integrated Solutions is a full service IT company that provides cloud, mobility and social solutions to small and medium businesses.1 Over the past decade, C3 has evolved from a telecommunications business to an IT provider that is squarely focused on helping organizations achieve maximum efficiency through the Microsoft 365 Cloud. In 2014, C3 was named Microsoft's Mid-Atlantic Cloud Partner of the Year. That same year, C3 ranked in the top 5 percent of U.S. Microsoft partners focusing on the small and mid-sized business market. Today, they're in the top 1 percent for sales. In April, C3 was named one of Virginia's Fastest Growing Companies by the Virginia Chamber of Commerce—an honor bestowed in late April 2018 at the 23rd-annual "Virginia Fantastic 50 Awards Banquet." The company recently launched an initiative to help small and mid-sized businesses working with the Department of Defense comply with new cyber requirements and standards. C3 Integrated Solutions' President Bill Wootton and Executive Vice President Kevin Lucier recently talked with the Rosslyn BID about the company's growth and future direction. Rosslynva.org: You've built your business around the Microsoft 365 Cloud. Tell us a bit about what you do. Bill Wootton: Well, we say we take clients on a 'Cloud Journey.' First, we do onboarding: moving folks from wherever they are—often it's an old Exchange-based server email—and bringing them onto the Microsoft 365 Cloud. Next, we focus on security: evaluating a client's risk profile and building awareness for basic housekeeping, such as mobile device management and multifactor authentication, all the way up to high-end compliance work. Finally, we use the technology to drive the business value-added. At this point, our work transitions from being a technically focused effort to a business process effort. Kevin Lucier: We're educating the customer. A lot of prospective customers are in outdated technology when we first start with them. Others have the technology but don't know how to use it or adopt it. We look at business processes as well as the technology. We try to understand how our customers work. Bill: Email has been the entry point for many. A lot of folks have bought Office 365 and need to develop it a little further. We help folks who get on the platform and want to take the next step and take advantage of the tools available to them. Rosslynva.org: Do you have a typical client? Bill: We work with clients ranging from two people to 1,000+ person companies. We very comfortably manage up and down that spectrum, but ideally we're in the 50-500 employee range. Our largest industry is government contractors. They're by far our largest market sector. Rosslynva.org: What motivates companies to seek out your services? Bill: We've been fortunate to get a lot of referrals. And, we have a couple of partners whom we trade business with. A few other factors drive client acquisition, too. The first is needing to do a tech refresh. For instance, a company's data may be sitting on a server and they may decide to move to the cloud, or they may realize their IT services provider isn't giving them everything they need. There may also be a major change in an organization, such as winning a big contract or moving into a new market. Reaching 50 employees is another big inflection point. People can get by without much IT support, but once they get past 25 or up to 50, they realize they need something better. We've done a lot of work with mergers and acquisitions. We just helped two companies spin off a 120-person joint venture. We did everything from soup to nuts: data transfers, email, data migration, setting up the office. We do the follow-up IT for our clients as well. We can be a complete IT solution for them. Kevin: Security is a huge issue for a lot of companies. We're also seeing companies needing to meet compliance requirements. Our goal is not to be a compliance shop but, from an infrastructure standpoint, to deliver the solutions that meet their compliance requirements. Rosslynva.org: Tell us about your new initiative to support government contractors who work with the Department of Defense (DoD). We know that's something you're very excited about. Bill: The federal government and DoD are rolling out a new set of cyber requirements and standards for government contractors. This is creating a real sea change in the industry right now because while the requirements are not overwhelming, they are a significant lift for what companies have done to-date. Microsoft has segmented a portion of their Microsoft 365 Cloud—Government Cloud—specifically for government and government contractors. We've been chosen as one of five Microsoft partners who will be able to sell this solution to small and mid-sized businesses. We're incredibly excited about this opportunity to be a leader in this market. Rosslynva.org: That's great! Being one of five sounds like a really big deal. So, if there was one tool from the Microsoft 365 Cloud that you yourself couldn't live without, what would it be? Bill: Microsoft Teams. It's becoming a central workplace hub. When Teams first came out, we organized all these teams within our own office. We're our own laboratory. We realized when it works and when it starts to become unwieldy and impractical. We came out of it really understanding it. We're a use case for our clients and that really helps. Rosslynva.org: I don't think we've ever used Microsoft Teams in our office, but presumably we have it! Bill (jumping up to draw on whiteboard): It's a really cool collaboration tool. You have a shared email, a shared library and then you have OneNote and a SharePoint site. You also get persistent chat. Plus, you can connect Microsoft Teams to other tools. So, for instance, if you wanted to monitor your company's Twitter feed, you could put a connector in there so your Twitter would sit on your dashboard. You can also create Channels. So, here at C3 we have a team on Thought Leadership. We have organized subjects for blogs, newsletters, social media and P.R. When I do our newsletter, I can go there for material. Rosslynva.org: I love that you're so enthusiastic about these tools that you actually had to go to the whiteboard to draw it all out. The fact that you're using them yourselves shows how wholeheartedly you believe in them. Do you ever do training videos or webinars? Bill: We're looking right now at how to put some of this content in a webinar. We're a small shop (ten people), though, so we want to be more focused on serving our clients. Rosslynva.org: Makes sense. Another question: We're wondering if there's a steep learning curve when companies start really making full use of the Microsoft 365 Cloud. How do you help them with that? Bill: We try to gauge a client's appetite for change and need to make a change. It's about organizational change and cultural change. Changing from an email thread to persistent chat, for instance, is a cultural change. Companies need to be ready to embrace that. We can help with change management or partner with someone who's more of an expert on that. We try to be conscious of where our boundaries are and where we're better in a team with a partner. But we are a one-stop-shop. If a partner is needed, we'll bring them in. Rosslynva.org: Right. So, I don't think we have any further questions—other than thinking about how we can use Teams in our own office. We really appreciate your time. We're glad to have companies like you in Rosslyn! Bill: Thank you. And we like being here! We remember touring the space when they were building it out. At the time, our big driver [for coming to Rosslyn] was commute. Kevin lives in South Arlington and I was right off 395. We wanted to minimize our commute. We were both running out to Herndon before that, and it was brutal. We've been watching Rosslyn grow up around us. It's exciting to see the new businesses coming in, as well as the new restaurants and the new residential. Rosslyn has been a great central point for us. 1. This description of C3 Integrated Solutions was taken from their Twitter profile. Photo at top: C3 Integrated Solutions partners Kevin Lucier, James Lucier, Jason Tierney and Bill Wootton at their offices at 1001 19th St. N. in Rosslyn.